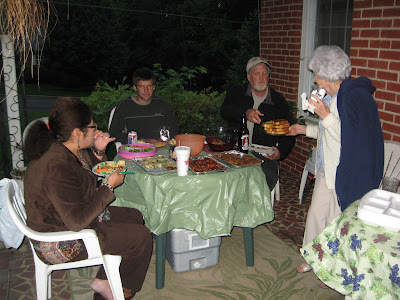 My son and I enjoyed a terrific cook out in Asheboro, NC last night with Greta and Joel and some of their neighbors. The plan was to watch a movie on the side of the water tank. No kidding. Of course, it rained. But that didn't put a damper on the party. Joel set up his projector in the house, so we had a movie anyway even if not on the water tank. Chef Joel was hard at work on the meat. He sent around the grilled Texas Toast and sauced up the chicken and pork chops. 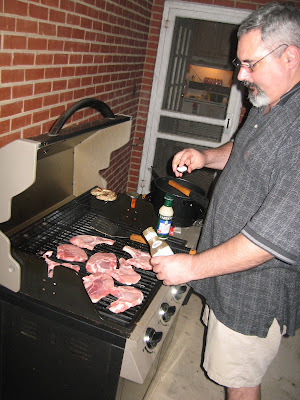 He used a variety of different sauces including a mustard based barbecue sauce from our sister state, South Carolina. 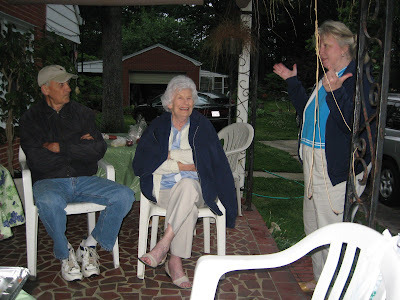 Greta and Joel have two nice porches which was great. Most of the guests hung out here on the side porch with the food (of course). The grill was around on the back porch. Joel just got a big gas grill and is enjoying that. Gas is more convenient and easier when you have a crowd over. Since we were shopping at the local IGA which is a small grocery, our appetizers were very traditional Southern. 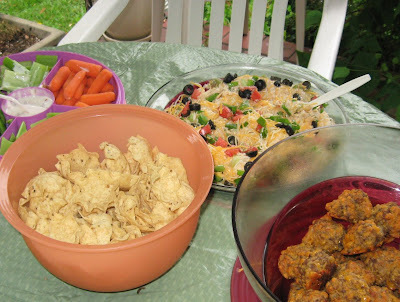 We brought sausage balls made with Frank Corriher sausage which is our favorite, Seven Layer Dip, and a veggie tray. The sausage balls were quite popular or else my son ate almost all of them - not sure on that. Neal from Jugtown brought some really fabulous finger foods. He had spinach wraps that were much like those that I had in Greece (very yummy), barbecue shrimp (my son went wild for those), and crab appetizers. When the meat came off the grill, yum! Joel had them just perfect. 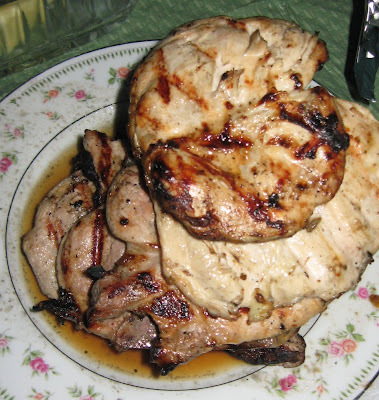 Very moist chicken and chops with loads of flavor.